Joie Studio will be along one of the walls in the Gallery at Bazaar Bizarre this Sunday! Dena and I are leaving tomorrow morning for San Francisco. We're going to celebrate my birthday (again) up in San Francisco and hopefully meet up with a couple of our San Francisco friends and family members after dinner Saturday night, and we're all yours Sunday morning! It should be a doozy! We're lugging our entire holiday collection up, and we'll also have show specials and sales, so look out for them! 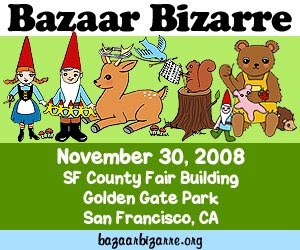 See you at Bazaar Bizarre! It's the day before Thanksgiving, but tomorrow my family will be here, so I want to take this chance now to do my own thanks-giving to you. First and foremost thank you to all my great clients and customers. Your incredible support and word of mouth has sustained my little studio and allowed it to grow. I feel so enriched by meeting so many wonderful people and companies through Joie Studio. It's a trip to see companies that I've worked with in magazines and clients I've worked with on TV. I get giddy seeing my clients' wedding pictures, knowing that Joie Studio was a part of their special day. I was so sad when Prop 8 in California passed because I just knew that it was because the majority of Californians who voted for it didn't know people like Jack and Paul, whom I had the privilege to call my clients and make their wedding invitations. And it's so much fun to meet people who read my blog at events! So thank you all, because Joie Studio would not exist without you. Thank you to the greater design community! 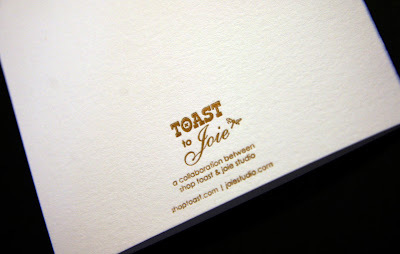 I am so excited whenever I see a post about Joie Studio on any blog! I cannot believe the incredible exposure hapa hale, Decor8, Poppytalk, Paper Crave, and others have given to Joie Studio. Throughout this last year, it's been so so great whenever I see a post about Joie Studio, and the response from your blog readers has been so awesome! And last but not least, thank you to my friends, new and old. To my good friends and collaborators Michelle from Shop Toast and designer Matt Cox, your designs are awesome and I can't wait for future collaborations! To my friends and family, thank you for your incredible support -- from showing up to craft events to helping pack cards and man booths, I really could not do it without you! 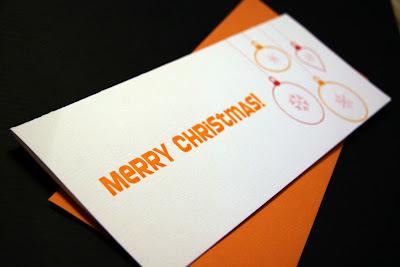 And to all my letterpress friends, thank you for your support. 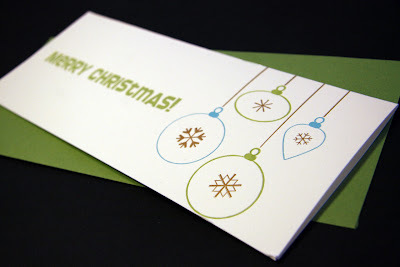 I love that letterpress is a collaborative community ! PS Here's a little thank you coupon to help you out on this great shopping weekend! It's good Thanksgiving Day through Sunday at Joie Studio's online store! 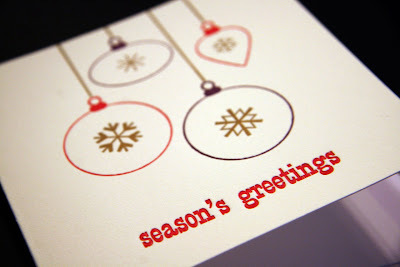 Joie Studio absolutely sold out of these cards last year, and so this year, we've brought them back, better than ever! We sold out of all the sets we brought to Felt Club, so I encourage you to grab them while you can. 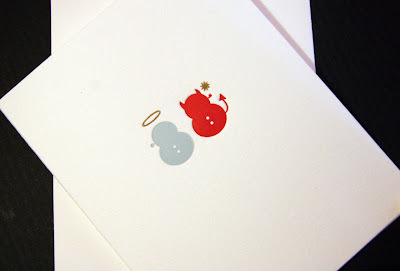 We have packaged more but I'm done printing holiday cards this season so get them while they last. They're in the Joie Studio Store and will be available on November 30th at Bazaar Bizarre! This design is a collaboration between Shop Toast and Joie Studio, which we hope will last a very very long time because I *heart* everything we've done so far. 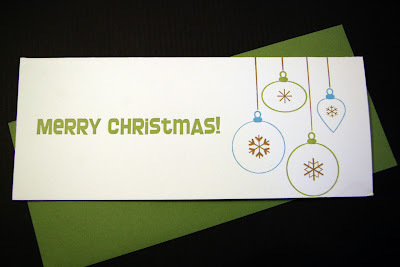 I also wanted to print this card with green as the primary color, and eventually decided on green, true blue, and metallic gold. Here it is! 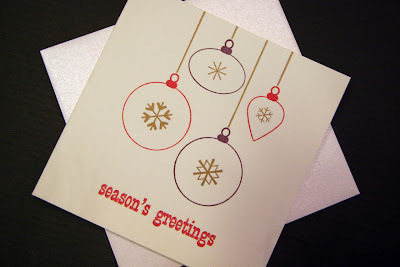 Our Eco-Friendly Cards: Holiday Sparkle! 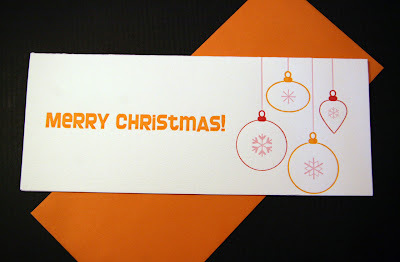 These gorgeous cards are based on Joie Studio's company card last year! These cards are super special because these cards are the first cards that I printed using only vegetable oil inks, making them our most eco-friendly letterpress cards to date! 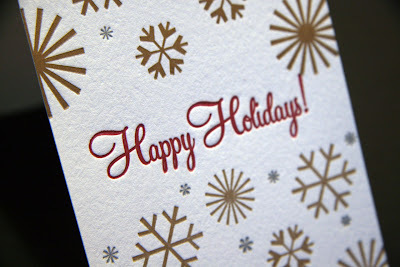 These letterpress cards are printed in all metallic inks -- metallic gold, metallic silver, and metallic red on 100% luxurious cotton (tree-free) cardstock. 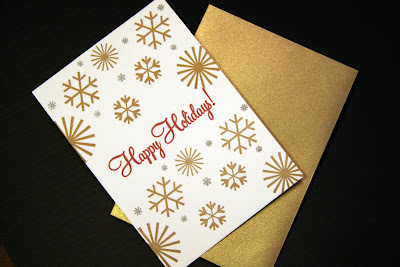 We've paired the cards with gorgeous metallic gold envelopes. A note on vegetable oil inks: I've done a lot of research on eco-friendly inks and there is a lot of controversy about the environmental impact of soy-based products. We'll just avoid the whole issue by offering vegetable oil based inks as an eco-friendly alternative to rubber based inks. We've been working with a local mom-and-pop ink company here in Los Angeles where they use vegetable oil as their oil base and custom mix (by hand!) our inks to order. That way, we reduce transportation costs, support our local economy, and utilize what we believe to be the best oil-based inks around. 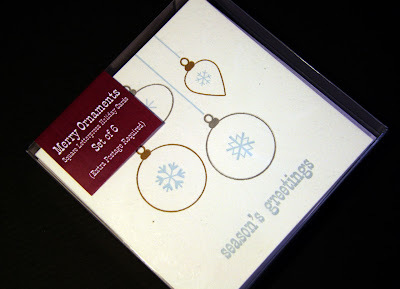 Our Square Holiday Cards: Merry Ornaments! 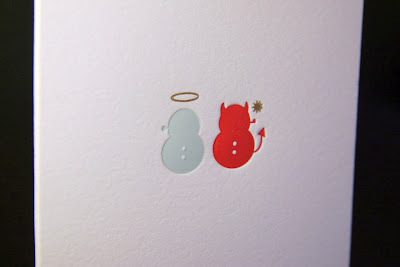 Introducing Joie Studio's first new holiday design -- Merry Ornaments! We have this design on 4.75" square cards in two different colorways and on #10 in two other colorways which I'll post separately. 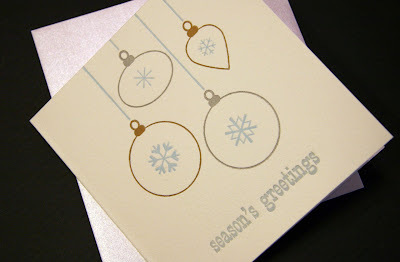 For the square cards, I handset "season's greetings" in gorgeously fun P.T. Barnum antique type. I *heart* this new font I acquired. How fun is it to have a font that was made for the circus? We're starting to do these fun labels (above) on our letterpress products. It's a slow conversion as everything is being labeled by hand with love, so it's new products first, old products next. 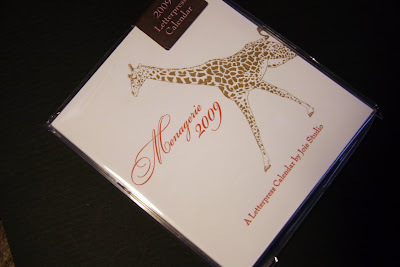 Here it is - Joie Studio's 2009 Calendar in all its glory! This year, it's animal themed after Joie Studio's Menagerie collection. The calendars are limited edition, so get them while they last! Yes, I'm pregnant! 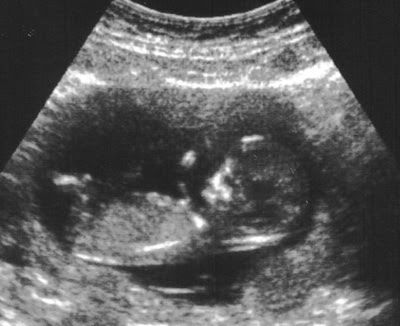 The ultrasound above is from last Friday at 12 weeks 1 day. Needless to say, October was not a good month for me personally, with the onset of "morning" sickness and unbelievable fatigue. You shouldn't operate a platen press if you're not feeling 100%, so letterpress printing was severely reduced in October. Then there was the issue of cleaning the press while pregnant. Now, I am not a fan of using cooking oil or shortening on the press for a couple reasons. One, vegetable oils leave a residue that become gummy and nasty over time if improperly cleaned off. Think accumulated kitchen grease. Eww. Now think of old cruddy kitchen grease accidentally getting in the gears of an antique press. Not good. Two, it just doesn't clean off inks as well, requiring that you use more oil, more rags, and more elbow grease. I am not a fan of slaving to get ink off the press. Three, and this is actually kind of not the greatest reason, you lose street cred with the old-time printers when you say you use cooking oil to clean the press. So I've been using California Wash, which is not the best smelling thing in the world. I figured if you can get high off the stuff, it's probably not good to be around when pregnant. I mean, the stuff smells like paint thinner, even watered down. The guys at Kelly Paper here in Pasadena were really nice and got me a bunch of solvents to try out (free samples! ), and I've actually been using the samples, which are all environmentally friendly with little to no VOCs. I definitely have my favorites, and they are all non-petroleum based ultra low VOC eco-happy products! I'm going to go back to Kelly to get the spec sheets on my favorites so I can tell you more about them. Thank you to everyone who stopped by and said hello at Felt Club yesterday. It was a tremendous success and we send all our love out to the Felt Club organizers for such a great event. 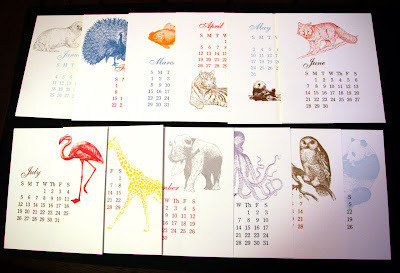 I debuted the 2009 Joie Studio desk calendar yesterday along with our holiday collection. They will be up online as soon as we can get the pictures taken. And speaking of calendars, thank you especially to my good friend Dena, who you might meet at craft fairs with me. Not only is she a great ambassador for Joie Studio, she also helped me tremendously by trimming and packing (they are hand packed with love, she explains) 150 calendars Saturday night to get them ready in time for Felt Club. I would not have been able to get the calendars (or half the cards, for that matter) done in time for the holidays without her help! Be prepared for an awesome 2008 holiday collection!